There are no White Castles in my neighborhood – in fact, there aren’t any on my whole coast – but I am well aware that the fast food chain has some extremely loyal fans out there and the chain tries to do everything they can to satisfy their White Castle cravings. White Castle is known for their burgers, but one of the four original items on the menu when the first White Castle opened was coffee, and they have a loyal following for that among WC fans, as well. 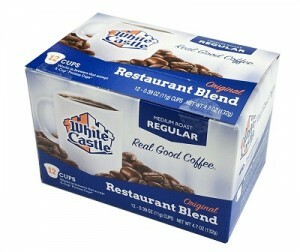 White Castle has been selling their ground coffee for a while now, but they just rolled out their own signature White Castle K-Cups so that fans can easily brew their own restaurant blend without having to leave the comfort of their own home – and with very little effort or cleanup. The only difference between using these and hitting the drive through is that you won’t have the opportunity to add burgers or other snacks to your order to go with your coffe. The cups are being sold online and should also be available in grocery stores in areas where you’ll find White Castle locations.